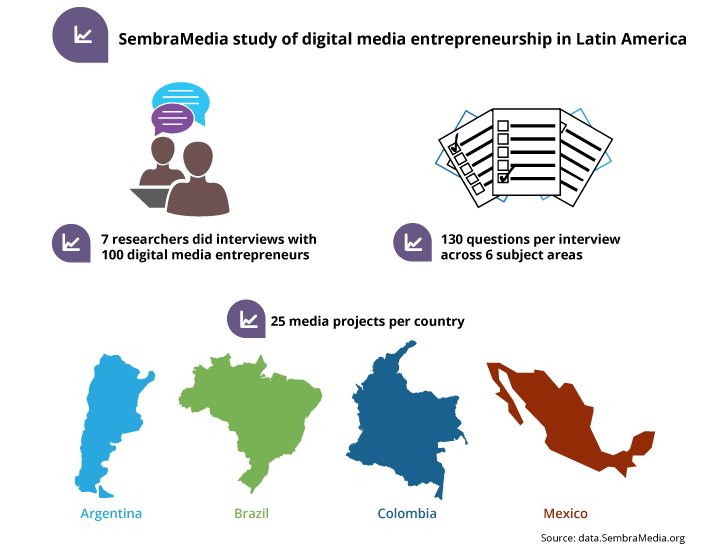 From December 2016 to April 2017, SembraMedia’s team of researchers conducted two-hour interviews with the founders or directors of 100 digital media startups, 25 each from four countries—Argentina, Brazil, Colombia, and Mexico. Seven researchers (four men and three women) worked on this extensive research project (their biographies are included at the end of this section). They were recruited because of their experience as researchers, digital journalists, and entrepreneurs. Their personal connections with digital media founders in their countries were crucial to gaining the trust of the entrepreneurs they interviewed. In confidential interview sessions, participants were assured that financial and other data would be kept private and only top-level findings would be shared publicly. Most interviews were conducted in person. All the interviews were conducted in the native language of the subjects (Spanish or Portuguese) and then translated into English to be included in this report. In each interview, researchers asked the same 130 questions, designed to reveal the inner workings of these outwardly impressive journalism organizations. The questions were divided into sections and covered: impact, challenges, business models, teams and management, audience, and innovation. The in-person interviews, the consistency and scope of the questions, and the personal connections of our researchers enabled us to delve deeply into impact, challenges, and audience, as well as expenses and revenues, and develop the insights in this report, which goes far beyond any previous study of Latin American digital media entrepreneurs. “We believe that studying the business models being used by Latin American digital natives can help us identify ways to strengthen the ecosystem. Of the 100 organizations surveyed, 90 answered every question, 10 declined to provide confidential financial information. After analyzing this rich data set, we were able to identify opportunities, trends, and emerging business models. We supplemented some of the data with third-party sources to provide context and consistency. We used traffic reports from SimilarWeb to ensure more consistent numbers for detailed comparisons on analytics. We also used Ghostery to help identify the use of advertising tags to identify participation in ad exchanges. The entrepreneurial journalism projects studied were selected because they provided a representative sample in terms of size, influence, technological sophistication, innovation, and/or dedication to quality journalism in Latin America in 2016. Research also selected a mix of geographic coverage areas: 44% consider themselves international, 63% national, 23% hyperlocal or provincial (some media identify themselves in more than one category). The preliminary research for this study was done by SembraMedia, a nonprofit organization dedicated to supporting digital media entrepreneurs, which was launched in October 2015. SembraMedia spent 14 months developing a searchable directory with more than 600 digital natives in 19 countries before this study was conducted. The selection criteria used to choose the 100 projects for this study were based on SembraMedia’s criteria for inclusion in its directory, which was developed over several months by an international team of journalists. (The criteria for inclusion is published in English and Spanish at SembraMedia.org). The digital natives studied in Brazil were selected by the lead investigator for Brazil, who has been studying digital natives there for the last five years. We also drew on the work of Agência Pública and their map of independent journalism in Brazil. After each interview was conducted, the results were entered into SurveyMonkey, which was used as a central repository for the data collected by our researchers. A team of four analysts then reviewed the data and developed the findings and insights included in this report. Their biographies are at the end of this document. The analysts spent several days normalizing and translating the data from Spanish and Portuguese into English, and then imported key segments into Excel for deeper analysis, calculations, and comparisons. The researchers collected 2016 revenue and expense numbers in the currency of the country where they conducted their research. The analysts then converted that financial data based on the average exchange rate for 2016, using rates provided by the World Bank. The one exception was the category of initial investment, where the currency exchange rate used was based on the year the project was founded. The age, audience size, and revenues of the digital natives studied varied significantly. Some launched in 2016, others were more than a decade old. Some reported more than a million dollars in revenue while others reported no revenues at all. To best manage these differences, most of the numbers used in this report were calculated as medians not averages. After analyzing the data from the 90 organizations that answered all the financial questions, four distinct levels emerged that cut across all four countries. Because we found a strong correlation between traffic and revenue, we determined the best way to categorize them was to start with total revenue, and then factor in the audience size, the top three revenue sources, content focus, and age. We also studied the size and structure of their teams. To avoid distorting these categories, we removed six outliers from this part of the analysis, including Linguoo, which is primarily a mobile application, two that had unique and significant revenue sources, and three that only publish information on social media sites. They are included in other sections of this report. Although we believe this report represents the most comprehensive investigation of digital natives in Latin America, we want to acknowledge the work of some of the other researchers and organizations that have studied this evolving market in the past. Here are a few of the studies, reports, and books that we consulted as we developed our research and produced this report.